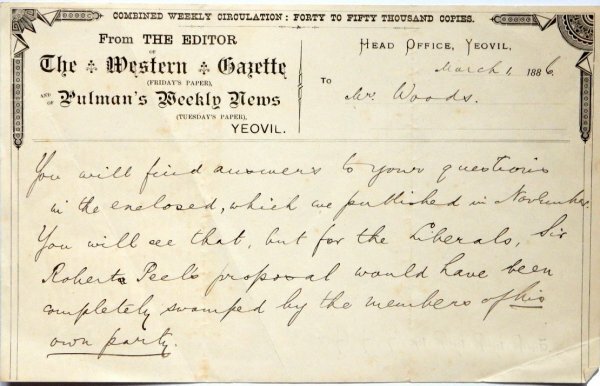 In 1863 a reporter on the Bridport News called Charles Clinker moved to Yeovil and, while living in a rented cottage in Brunswick Street, he founded his own newspaper which he called 'The Western Gazette'. The first issue was bought out on Saturday, 21 February 1863. 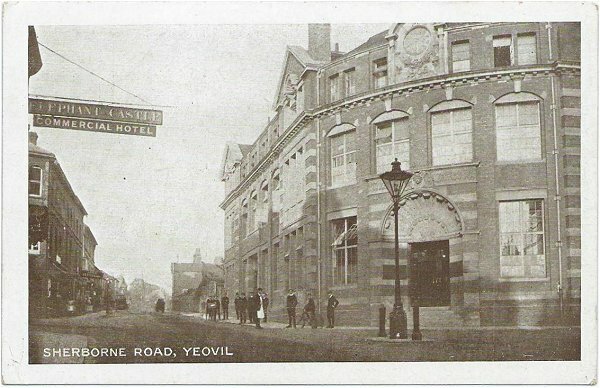 The main reason for Charles Clinker moving to Yeovil was the recently completed rail links which radiated across the region, thereby facilitating distribution of his newspapers. Charles went into partnership with Charles Tite, and together they acquired the rival Yeovil newspaper, the century-old Western Flying Post. They combined the two papers under the heading of 'The Western Gazette and Flying Post' on 21 June 1867. 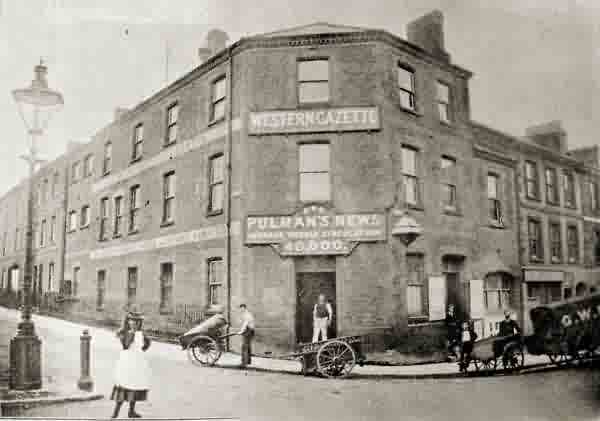 The newspaper proved extremely popular and its growth in circulation caused a move to purpose-built premises in Sherborne Road (see photograph below) in 1870, on the corner of Lower Middle Street and Newton Road. In 1872 the words 'Flying Post' were dropped and the newspaper became simply 'The Western Gazette'. In 1886 Charles Clinker died of a heart attack in a London hotel while on a business trip. He was aged just 51. 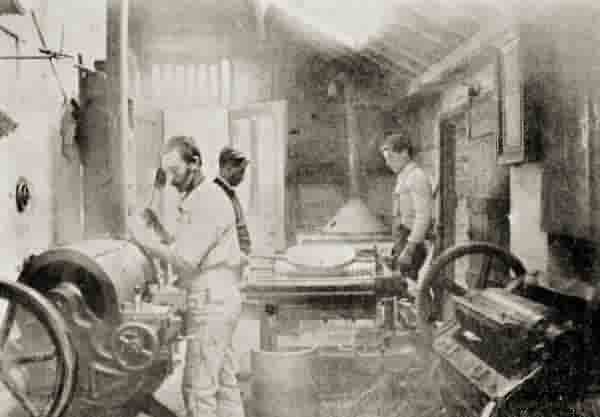 By the turn of the century the papers continued growth, combined with the need for improved printing presses, necessitated a move to new premises. These new premises were built on the opposite corner of Newton Road, with the foundation stone being laid by Litunga Lewanika (1842-1916), King of Barotseland (1878-1916), now the western part of Zambia, in 1902 who visited Yeovil while he was in England for the coronation of Edward VII. The offices were officially opened in 1906. 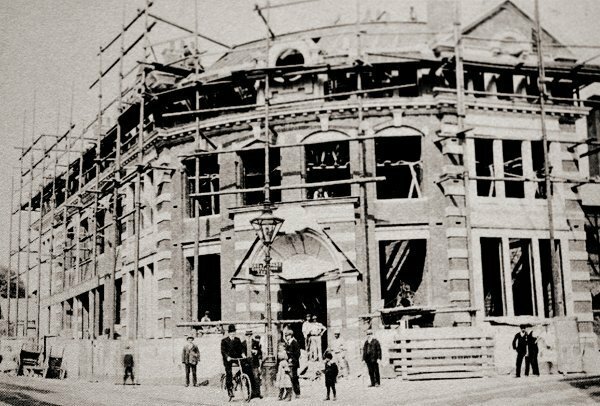 The building was designed by Bristol architects Oakley & Lawrence and built in the Renaissance style, the frontage is 45 feet high and the facade along Sherborne Road and Newton Road stretches a total of 141 feet. The construction company was Bird & Pippard, builders and undertakers of Middle Street. The new building was constructed using 600,000 bricks on a steel-girder framework (erected by FW Sibley & Co) and features honey-coloured Bath stone dressings. The head of the winged messenger god Mercury, above the door on the corner, was carved by Gilbert Seale of London. Mercury was the patron god of eloquence, messages and communication - hence his representation on the fabric of the Western Gazette. However he was also the patron god of financial gain, commerce, trickery and thieves and was, further, the guide of souls to the underworld. Which begins to make altogether more sense when connected to newspapermen! 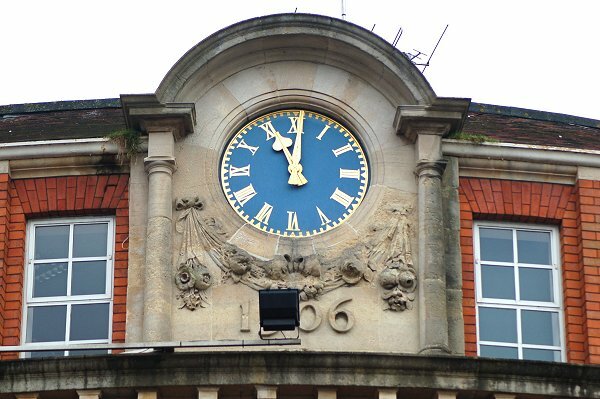 The clock above was erected by Yeovil jeweller EM Seddon of the Borough. 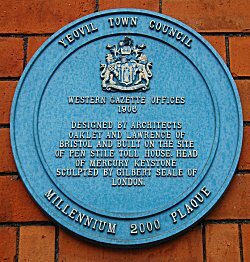 It was described as "an ornament and an honour to Yeovil." At the time of opening in 1906, 120 employees worked in the building. 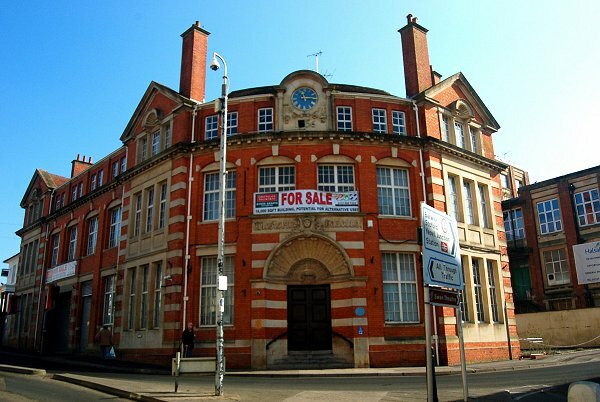 In 1907 the old offices, on the opposite corner of Newton Road from the new offices, were sold off. The notice of sale, illustrated below, gives an excellent description of the layout, usage and number of rooms in the old building. It was built as a combination of factory and offices with a 500-ton concrete base designed specifically to accommodate the huge weight and movement of printing presses. 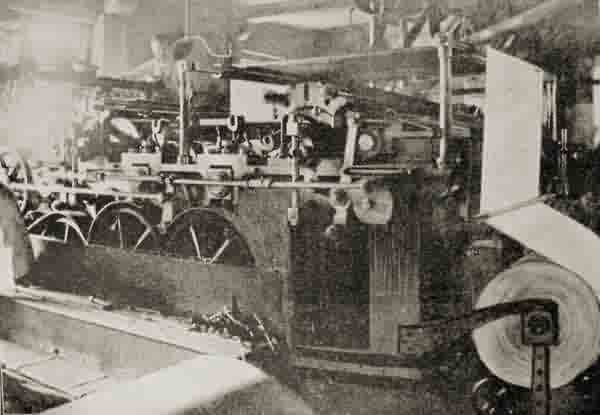 The original triple-decker printing equipment was capable of producing 24,000 newspapers an hour and was housed in an 80-foot long printing room. There was also a composing room which housed 'hot metal' linotype and monotype setting machines. In 1925 a new four-deck printing press was installed, capable of printing 36,000 copies of the newspaper an hour. The old three-deck press was retained and used to print other newspapers owned by the company. 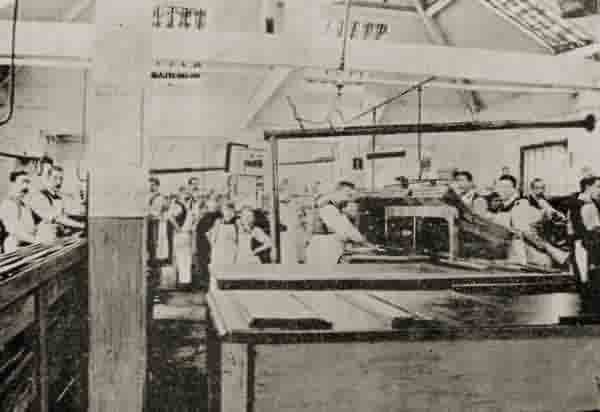 A third printing press, second hand, was acquired in 1939 from Fleet Street, London, and housed in an annex in Newton Road, effectively doubling print output. The Western Gazette was sold to Bristol United Press in 1965 and the printing press was relocated to the Lufton Trading Estate in the 1990s. Since the 1980s newspaper production has increasingly relied on computerisation. 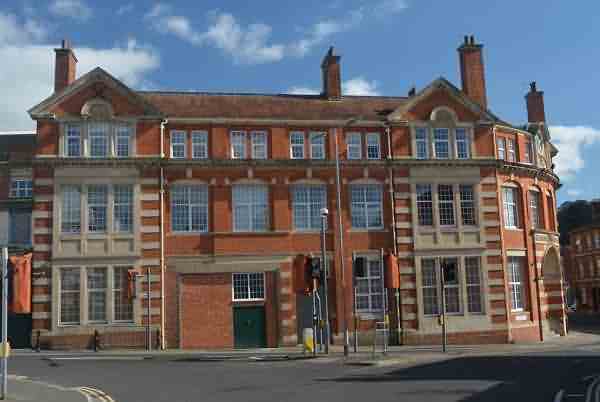 As a consequence many staff were relocated and the offices on the corner of Newton Road finally closed in 2010. The building is currently (2016) being converted to flats. Many thanks to Robert Bond for the following - "The newspaper was indeed purchased by the Bristol United Press in 1965, and the press remained at Sherborne Road until it was dismantled in the early 1990s and a new litho (the old press was letterpress) was built at the purpose built hall at Lufton, just north of the football ground. The invoice you illustrate was printed by the little known General Printing Department (where I worked from 1966 to 1993, when it was closed down) located on the first floor above the loading bay on Sherborne Road. We were mainly commercial printers and had a bookbindery in the room with the windows to the left in the photograph on the same floor. The bookbinder took early retirement in 1986 but we continued to sent bindery work to him until we closed (he then retired and I took over the bookbinding for the last 23 years). When I mention working at the Gazette most people assume I was on the paper and they are surprised to hear that there was a commercial printing department." 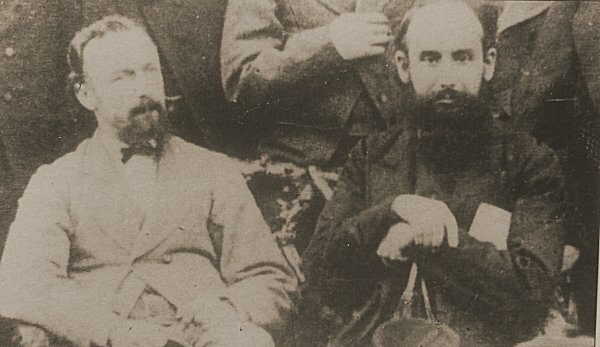 Charles Tite, left, and Charles Clinker, the joint proprietors of The Western Gazette. Photographed around 1880. A headed memorandum from the Editor, dated 1 March 1886, in reference to an enquiry concerning the repeal of the Corn Law in 1845. 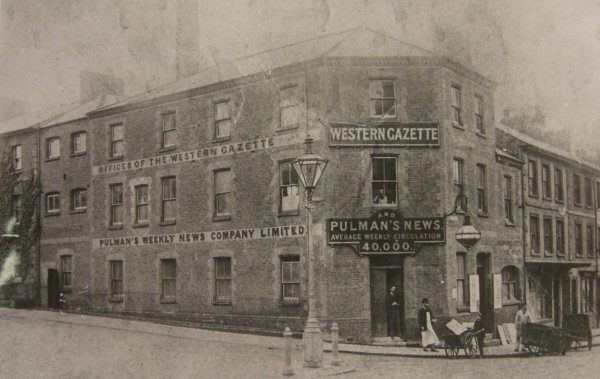 The Western Gazette offices, photographed in 1895, on the corner of Newton Road running off to the left and Middle Street off to the right. This was before the new building was built on the opposite corner in 1906. 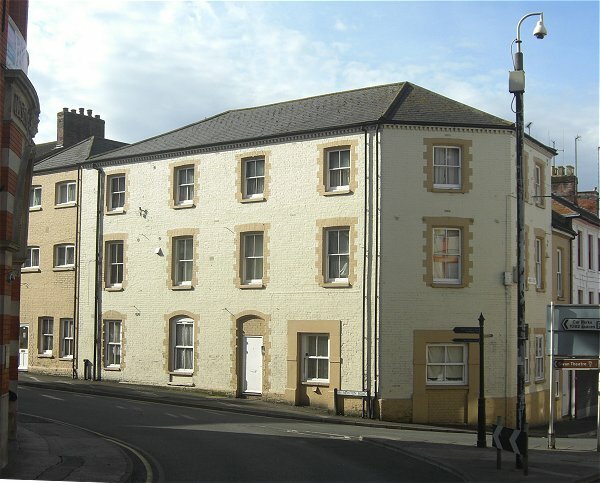 This building, purpose-built for the Western Gazette in 1870, still survives but is now flats. The News Composing Room from the 1895 edition of the Western Gazette Almanac. The Stereotyping Room from the 1895 edition of the Western Gazette Almanac. The printing press, known as the 'Victory News Machine', from the 1895 edition of the Western Gazette Almanac. The General Printing Room from the 1895 edition of the Western Gazette Almanac. 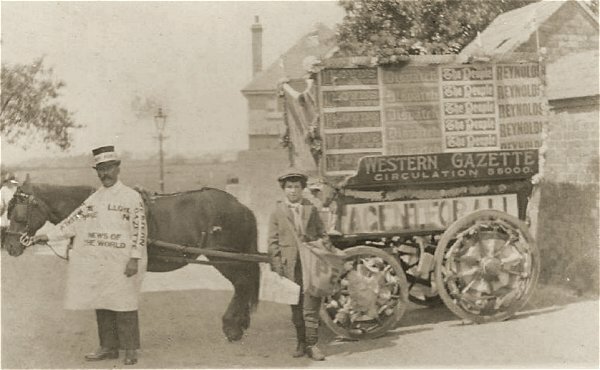 The Western Gazette offices photographed around 1900. 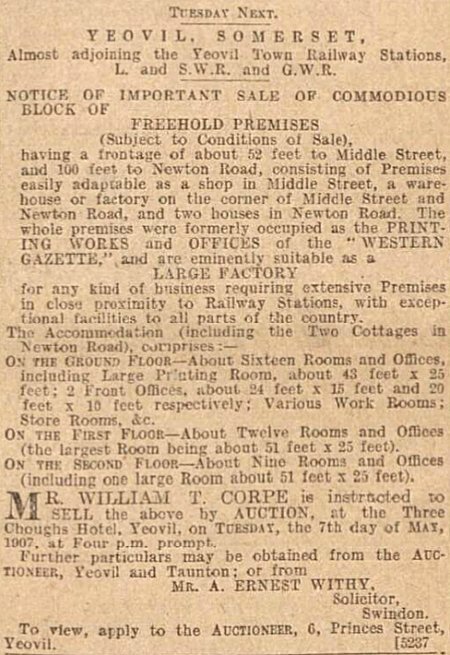 This notice of sale comes from the Western Gazette's edition of 3 May 1907 when the old offices on the opposite corner of Newton Road from the new offices were sold off. The notice gives an excellent description of the layout, usage and number of rooms in the building. 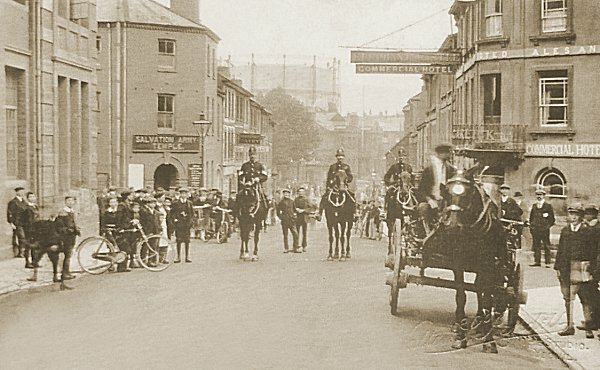 Courtesy of George Hallett - This photograph features in my book 'Yeovil From Old Photographs'. 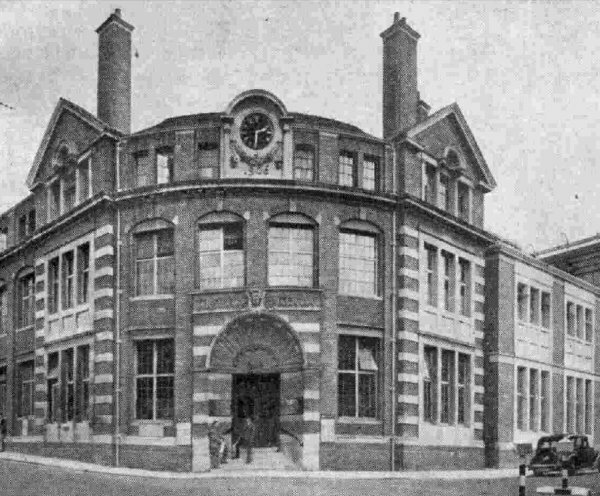 By 1918, the date of this Rendell photograph, the former Western Gazette offices were being used as a Salvation Army Temple. Note too the gasometer dominating the view into town. 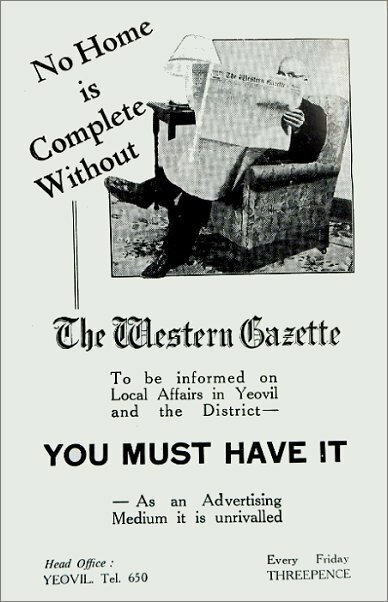 Early Western Gazette advertising. I'm guessing at a date of around 1910. The same building photographed in 2013. An advertisement for Clinker & Tite's "Western Gazette" in Whitby's 1881 Yeovil Almanack Advertiser. 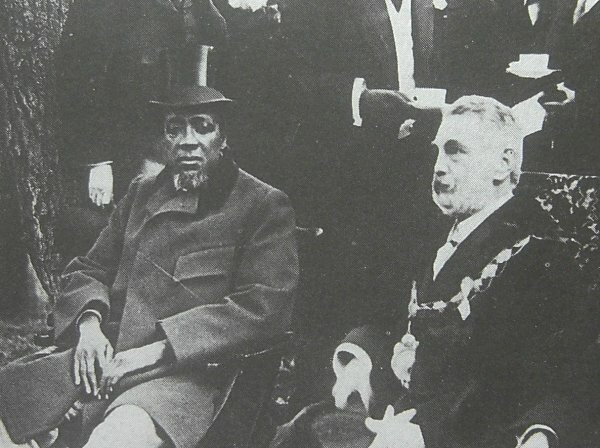 Mayor Sidney Watts and Litunga Lewanika (1842-1916), King of Barotseland (1878-1916) - now the western part of Zambia - at the Mansion House on 5 June 1902. 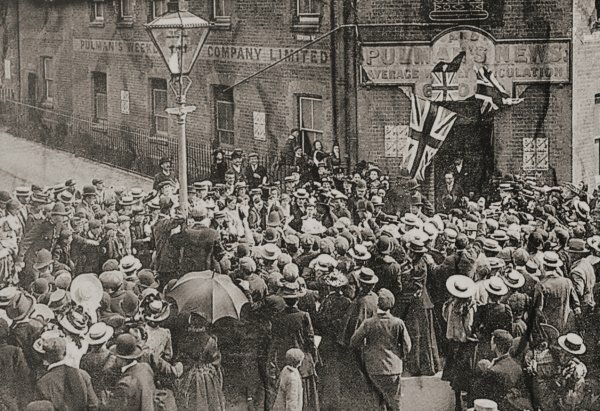 The king was in England to attend the coronation of Edward VII but while in Yeovil he laid the foundation stone of the new Western Gazette building. King Litunga Lewanika of Barotseland (at almost dead centre, wearing a silk top hat) leaves the old Western Gazette building and walks through the crowds to lay the foundation stone of the new Western Gazette premises. Photographed in 1902. 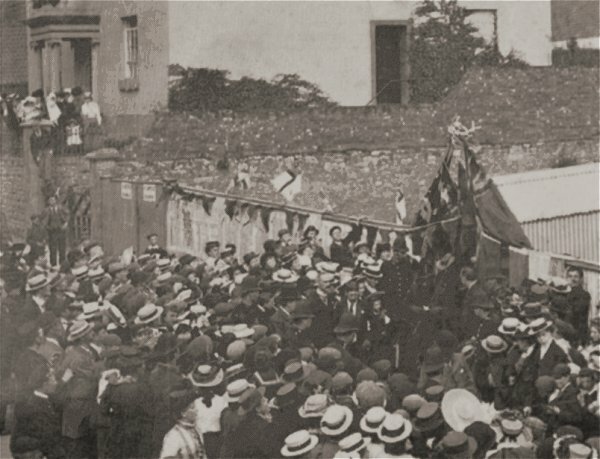 King Litunga Lewanika of Barotseland (in silk top hat, just below and slightly to the left of the flags) performs the foundation ceremony of the new building in June 1902. At the top of the photograph is Osborne House. The early days of construction, with some of the 600,000 bricks being unloaded from the horse-drawn delivery cart of Fred Bird. 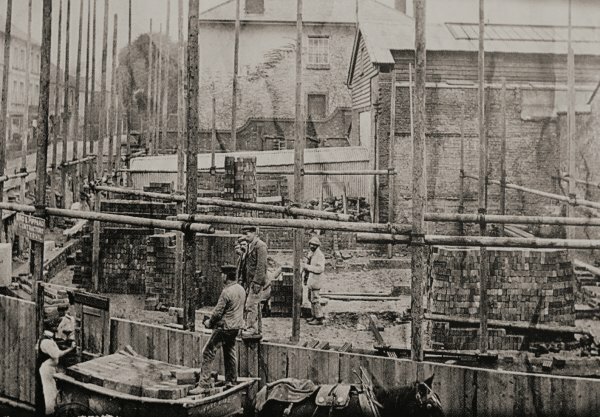 The construction company was Bird & Pippard, builders and undertakers of Middle Street. The structural steelwork frame was erected by FW Sibley & Co.
More horse-drawn deliveries, this time part of the carved stone arch above the main entrance. 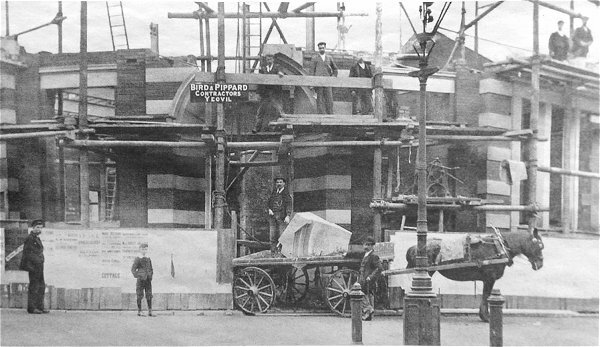 The second lift under way, probably photographed in 1903. Note the internal structural steelwork visible through the two windows above the entrance. 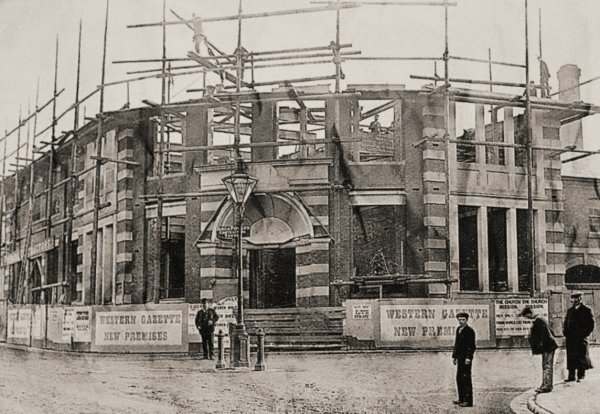 The new Western Gazette building under construction in 1905. A publicity postcard, produced for the opening of the new building in 1906. This card was posted in 1907. A postcard of about 1910 looking towards Townsend and featuring the newly-built Western Gazette offices on the corner of Newton Road. I have two slightly different postcards with this image, one unused and the other posted in 1913. From my collection. 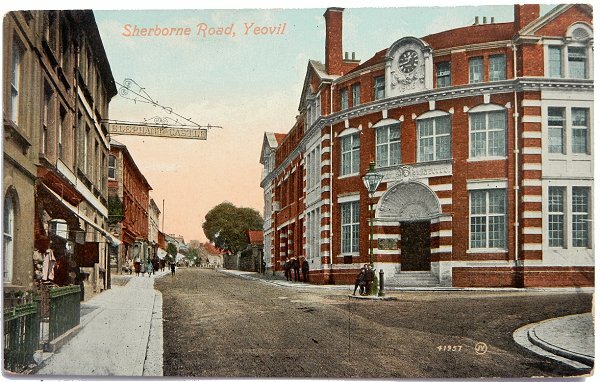 This image features in my book 'Yeovil - The Postcard Collection'. A hand-coloured, unused postcard showing more of Sherborne Road and a sunrise sky. 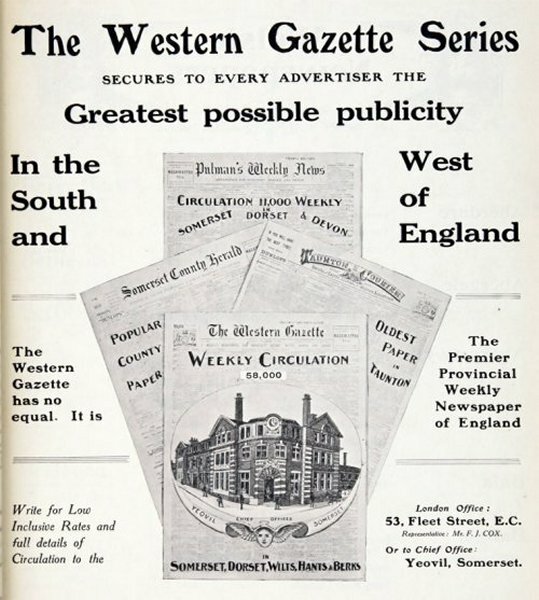 A Western Gazette advertisement in a Yeovil Guide of the late 1920s. 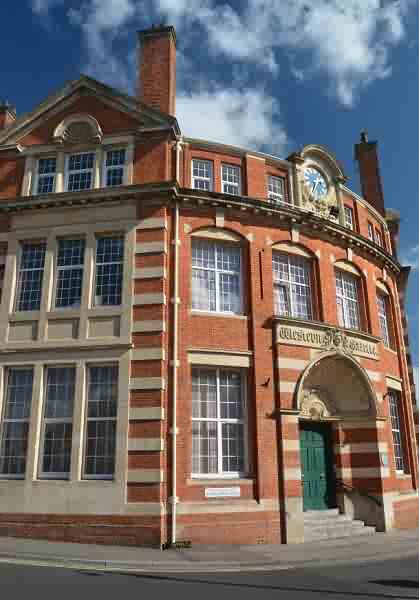 The 1906 Western Gazette building - closed and photographed in 2013. 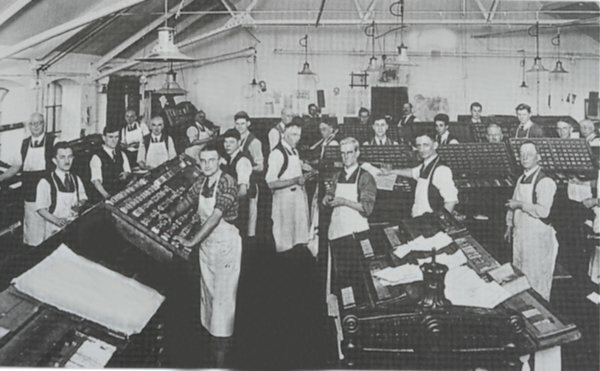 A photograph of the composing room, probably taken during the 1930s, where typesetting was carried out manually. 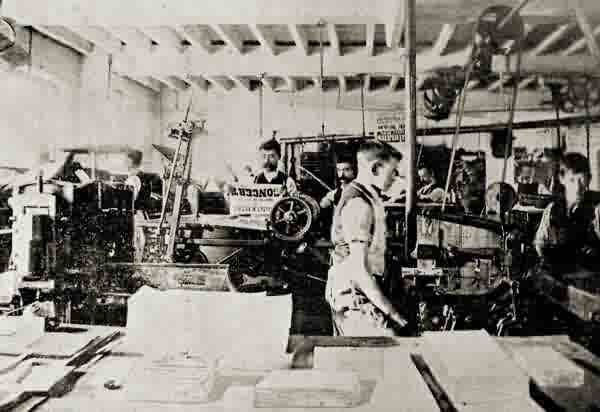 The Western Gazette's new rotary press room was the square building at far right, behind the car. This particular part of the building is rarely seen in photographs as it was later demolished. It was built in 1938 (see the datestone in the next photo) to house the new rotary press shown below. 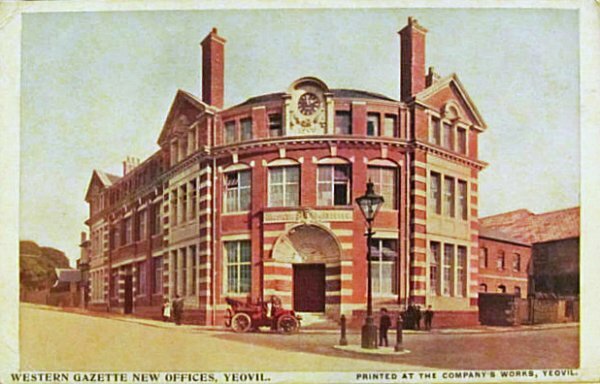 The structural steelwork was supplied and erected by FW Sibley & Co Ltd of Yeovil and the new machine room was built and alterations to the existing premises were carried out by Pippard & Perry of Yeovil. 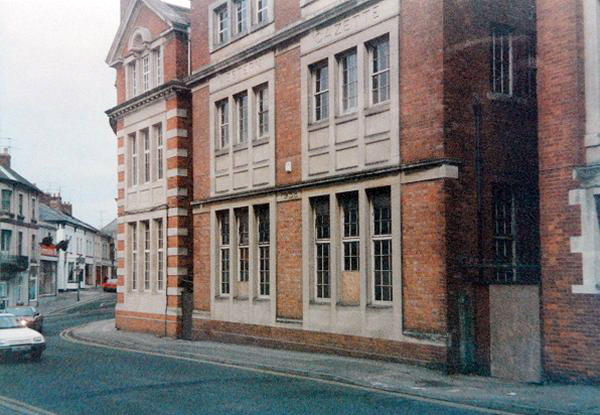 The rotary press building photographed in 1983. Note the 1938 datestone at the top, and in between, the two ground floor windows. 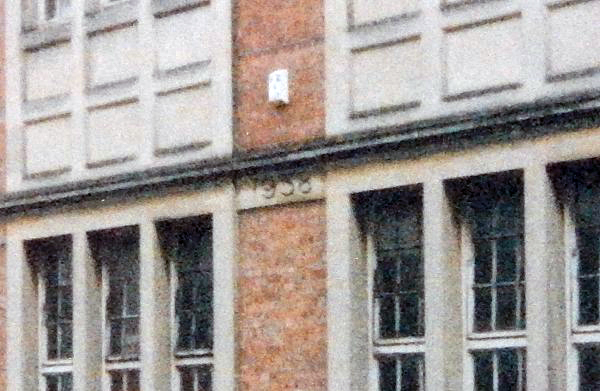 The 1938 datestone, enlarged from the previous photograph. 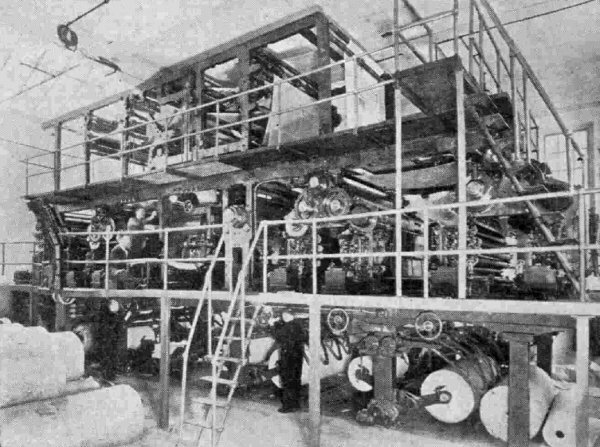 The Western Gazette's new rotary press, installed in August 1939. 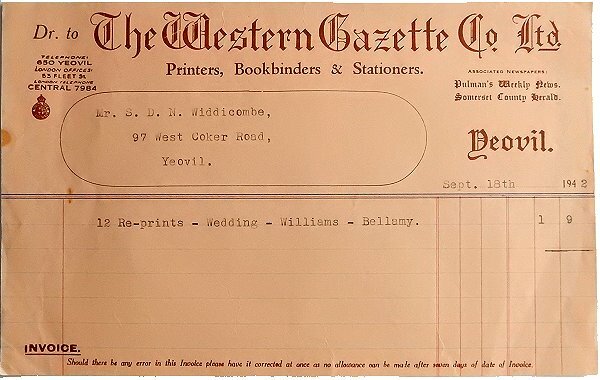 An invoice from the Western Gazette, dated 1942, for reprints of photographs. 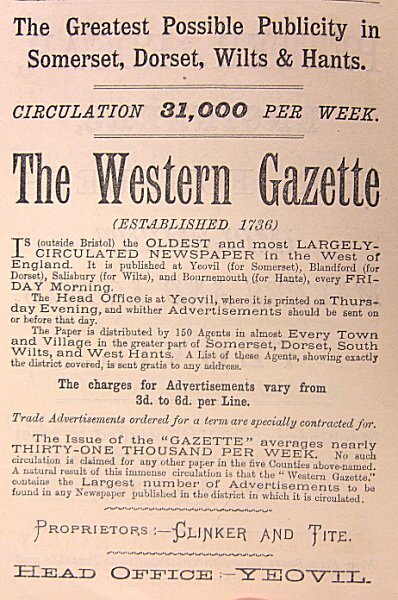 The masthead indicates that the Western Gazette were printers, bookbinders and stationers in addition to publishing their newspapers. A 1940's newspaper advertisement for the Western Gazette series of papers. 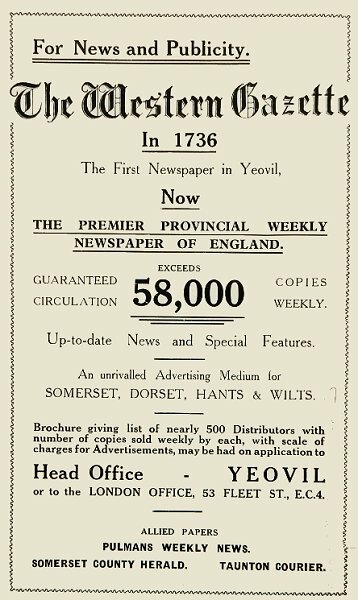 The Western Gazette's advertisement in the 1953 Yeovil Guide. 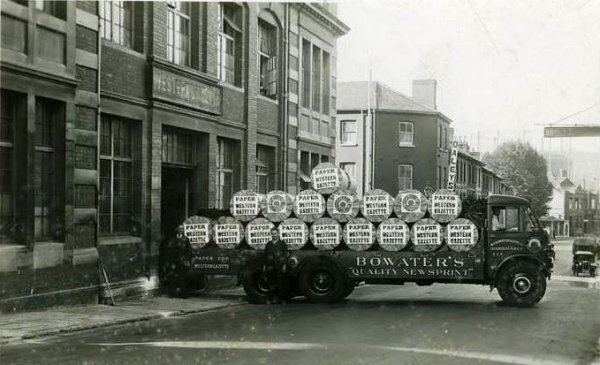 Rolls of newsprint being delivered to the Western Gazette. I well remember this frequently blocking the road and halting traffic while the lorry backed into the narrow entrance, but strangely nobody seemed to mind at the time. 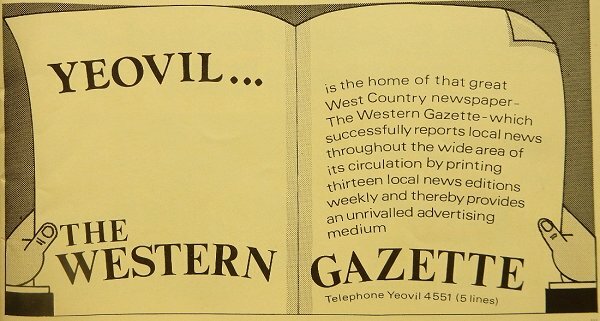 The Western Gazette advertisement in the 1970 Yeovil Town Guide. The impressive entrance on the corner of Lower Middle Street and Newton Road. Photographed in 2013. 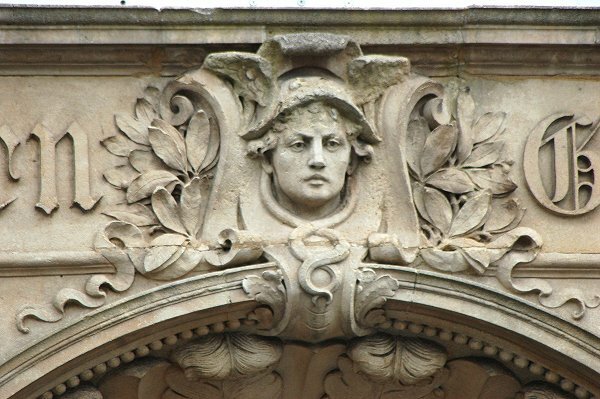 This photograph features in my book "Yeovil In 50 Buildings"
Mercury was the patron god of eloquence, messages and communication - hence his representation on the fabric of the Western Gazette. However he was also the patron god of financial gain, commerce, trickery and thieves and was also the guide of souls to the underworld. Which begins to make altogether more sense when connected to newspapermen!!! The head of Mercury was carved by Gilbert Seale of London. The clock above was erected by Yeovil jeweller EM Seddon of the Borough. Photographed in 2013. Oh, the ignominy! 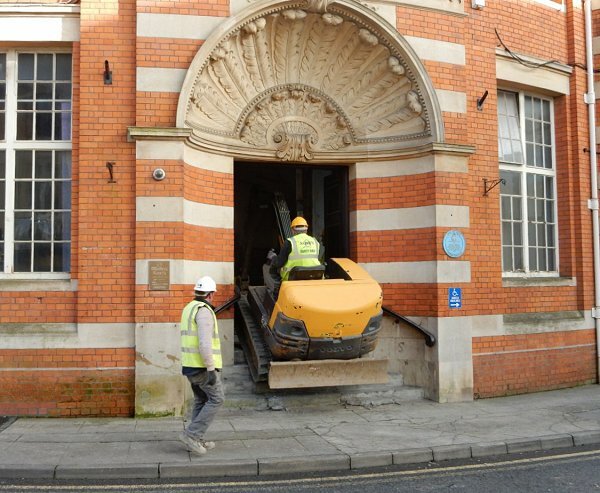 Photographed as I passed by the building, January 2015, and featured in the Western Gazette edition of 5 February 2015, albeit without credit to me as photographer. 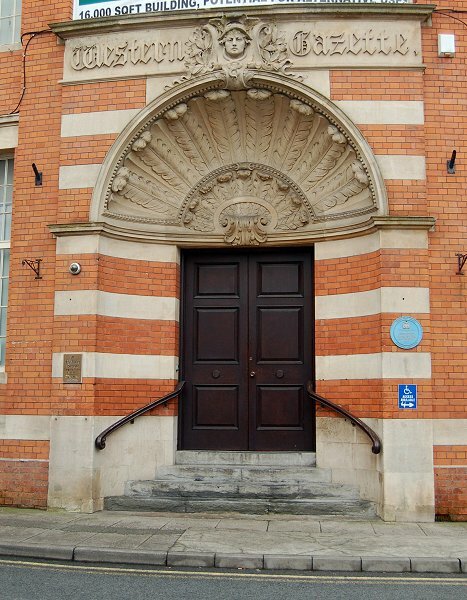 The entrance corner of the building which is now converted to flats. Photographed in 2017. The former Western Gazette building, now converted to flats, photographed from Wyndham Street in 2017.